Pepperdine University is a private research university affiliated with the Churches of Christ and located near Malibu, California. It is the location for Seaver College, the School of Law, the Graduate School of Education and Psychology, the Graziadio Business School, and the School of Public Policy. Courses are taught at the main campus, six graduate campuses in southern California, a center in Washington, DC, and at international campuses in Germany, England, Italy, China, Switzerland and Argentina. The Ed.D. program in Organizational leadership, (EDOL) has held international courses in China, Argentina, Chile, Belize, Costa Rica, and India. In February 1937, against the backdrop of the Great Depression, George Pepperdine founded the university as a Christian liberal arts college in the city of Los Angeles. On September 21, 1937, 167 new students from 22 different states and two other countries entered classes on a newly built campus on 34 acres (14 ha) at West 79th Street and South Vermont Avenue in the Vermont Knolls neighborhood of South Central Los Angeles, referred to later as the Vermont Avenue campus. By April 6, 1938, George Pepperdine College was fully accredited by the Northwest Association. Pepperdine had built a fortune founding and developing the Western Auto Supply Company, which he started with a $5 investment, but his prosperity led to his greater ambition to discover "how humanity can be helped most with the means entrusted to [his] care. [He] considered it wrong to build up a great fortune and use it selfishly." Pepperdine voiced his twofold objective for the college that bore his name, "First, we want to provide first-class, fully accredited academic training in the liberal arts ... Secondly, we are especially dedicated to a greater goal—that of building in the student a Christ-like life, a love for the church, and a passion for the souls of mankind." By the 1960s, the young college faced serious problems. The area around the Vermont Avenue campus developed issues with crime and urban decay; tensions also arose due to the Civil Rights Movement and attempts to circumvent it such as California Proposition 14, which challenged federal fair housing laws. The situation exploded in the 1965 Watts Riots. In 1969 activists in the Watts area threatened to burn down the campus; however, they were talked out of it after all-night negotiations by then-President M. Norvel Young. In addition, the Vermont Avenue campus was running out of room to expand. In 1967, the school began planning to move the undergraduate campus and a committee was formed to look at alternative locations, including sites in Valencia, Orange County, Ventura County and Westlake Village. Pepperdine favored the Westlake Village location until the Adamson-Rindge family, who owned hundreds of acres near Malibu, offered 138 acres (56 ha) of land. Despite concerns over building costs on the mountainous site, the school decided to move forward based on its prime location and potential for raising donations. Construction began on April 13, 1971 and the new campus opened for student enrollment in September 1972. The campus and many of its buildings were planned by Los Angeles-based architect and urban planner William Pereira. The old campus was sold to Crenshaw Christian Center, whose minister, Frederick K.C. Price, then oversaw construction of the "FaithDome," the largest domed-church in the United States, seating over 10,000. 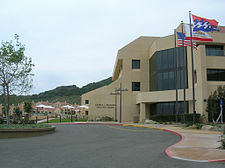 Pepperdine gained university status in 1971 when the school of law was added and the business and education departments became separate schools. In the 1980s, Pepperdine rose to prominence as one of the United States' leading centers of conservative politics, attracting many conservative-leaning professors from nearby UCLA and USC. Prominent conservatives on the Pepperdine faculty have included Bruce Herschensohn, Ben Stein, Kenneth Starr, Arthur Laffer, Douglas Kmiec, and Daniel Pipes. Smoke billows on a hill near Pepperdine University's Theme Tower. In 1985, 1993, and 1996, massive brushfires threatened the campus with destruction, but firefighters successfully protected almost all structures. On October 21, 2007, fast-moving wildfires forced campus residents to relocate and shelter in the Firestone Field house and Cafeteria, plus evacuations of local homes and businesses. Similarly, another November 2007 fire in Corral Canyon, accidentally set off by a group of Los Angeles youths, caused an evacuation of the Drescher Campus. However, most students were off-campus for the Thanksgiving holiday. The campus was again threatened by the Woolsey Fire in November 2018. The main campus is located among several ridges that overlook the Pacific Ocean and the Pacific Coast Highway in Malibu, California. It is widely considered one of the most beautiful college campuses in the world in terms of scenery and architecture, and has been described as "a place that looks more like a beach resort than a private university." The main campus entrance road ascends a steep, well-groomed grassy slope past a huge stylized cross known as the Phillips Theme Tower, symbolizing the university's dedication to its original Christian mission. Most buildings were constructed in a reinterpretation of Mediterranean Revival Style architecture (red tile roofs, white stuccoed walls, large tinted windows). The majority of the construction on the main campus was completed in 1973. There are views of the Pacific Ocean, Catalina Island, Palos Verdes Peninsula, Long Beach and the westside of Los Angeles from numerous points. Alumni Park is located on the campus. It is a 30-acre expanse of lawns, trails, hills, ponds and coral trees overlooking Pacific Coast Highway and the Pacific Ocean. Landscape architects (Eric) Armstrong and (S. Lee) Scharfman were responsible for the campus green space planning and design. Graduations take place at Alumni Park. The main academic plaza for undergraduate programs of Seaver College lies just above Alumni Park and includes Stauffer Chapel, Tyler Campus Center, Payson Library, and the Ahmanson Fine Arts Center. Undergraduate housing and athletic facilities sit to the north/northwest of the academic complex. The Law School exists even higher above these areas. The central campus is surrounded by a loop road consisting of Seaver Drive, Huntsinger Circle, and John Tyler Drive. Banowsky Boulevard separates Alumni Park from the main academic complex and is named in honor of William S. Banowsky, the 4th president of Pepperdine. Spur roads to the east of the central part of campus lead to faculty housing. To the northwest, Via Pacifica winds uphill to the Drescher Graduate Campus, completed in 2003 and home to the School of Public Policy, the Villa Graziadio Executive Center, as well as the full-time programs of the Graziadio Business School and the Graduate School of Education and Psychology. Housing for graduate students, undergraduate honors students, and faculty are also located here. The Graziadio Business School and the Graduate School of Education and Psychology are headquartered in West Los Angeles at the Howard Hughes Center next to Interstate 405. These two schools also offer programs at graduate campuses in Encino, Irvine, Santa Clara, and Calabasas. International programs of the University's various schools have taken place in London, Heidelberg, Florence, Buenos Aires, Paris, Madrid, Lausanne, Johannesburg, Tegucigalpa, Brisbane, Chiang Mai, Hong Kong and Tokyo. 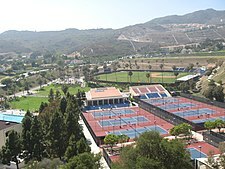 Seaver College is named for Mr. Frank R. Seaver and his wife, the principal benefactors of Pepperdine's Malibu Campus. The college offers undergraduates a liberal arts education, and each candidate for a bachelor's degree must complete a series of general education courses crossing disciplinary lines. Seaver College students attend classes at the Malibu main campus and study abroad courses are offered at the University's permanent international campuses in Heidelberg Germany, London England, Shanghai China, Washington D.C., Florence Italy, Lausanne Switzerland, and Buenos Aires Argentina. Michael Feltner is the current dean. Pepperdine University's Graziadio Business School enrolls approximately 2,000 students in its full-time and part-time degree programs. The school was founded in 1969, and has since graduated over 30,000 alumni. Deryck J. van Rensburg has served as dean since 2014. In 2016, U.S. News & World Report ranked the online MBA program tied for 15th best in the country, and the part-time MBA program was ranked at 29th nationally. In 2016, U.S. News & World Report ranked Pepperdine overall 65th out of 437 business programs in the United States. The Keck Science Center, an example of the Mediterranean architecture of the university. The School of Law is adjacent to Seaver College, and enrolls about 670 students. It is fully accredited by the American Bar Association and is a member of the Association of American Law Schools. The School recently attained membership in the prestigious Order of the Coif. The School's Straus Institute of Dispute Resolution is consistently ranked as a leading dispute resolution program, offering Master's and Certificate programs. Other degree programs include the Juris Doctor/Master of Divinity with Seaver College, the JD/MBA, JD/MPP, and JD/MDR. The school offers both a summer session and a fall semester in London. Deanell Reece Tacha is the dean emeritus, and the current dean (as of June 1, 2017) is Paul L. Caron. The school is ranked 51st among the nation's "Top 100" law schools by the 2020 U.S. News & World Report rankings. It is known for its entertainment law program. Approximately 120 graduate students are enrolled in the School of Public Policy, which offers a two-year master's degree in public policy. MPP/MBA degree with the Graziadio Business School. Notable faculty at the School include Ted McAllister, James Q. Wilson, James Prieger (Senior Economic Advisor, FCC), Joel Fox, Angela Hawken, Gordon Lloyd and Robert Kaufman. Notable graduates include a former member of the Bush Administration: Eryn Witcher, Director of Television. The current dean of the school is Pete Peterson. Pepperdine's Fall 2016 enrollment was 7,826 students, of whom 3,542 are at the undergraduate and 4,284 at the graduate and professional levels. Approximately 59% of students are female and 41% are male. In the 2015 academic year, the freshman retention rate was 92%. 12,134 students applied for admission to the undergraduate class of 2022, with 4,249 being admitted (35%). Among admitted freshmen, the interquartile ranges for SAT composite scores and unweighted GPAs were 1270-1420 and 3.62-3.95, respectively. Admission to Pepperdine is rated as "more selective" by U.S. News & World Report. Pepperdine University is part of the Yellow Ribbon Program for Veterans. Like several other colleges and universities that participate in the program, Pepperdine University offers support for an unlimited amount of veteran students as well as an unlimited monetary contribution toward each veteran's tuition assistance. As of 2016, 72% of Pepperdine students who are veterans are in the Yellow Ribbon Program which enables Veterans to attend tuition-free. The Princeton Review ranked Pepperdine on the list of colleges with "Dorms Like Palaces" in 2004 and 2007 and #1 under "Most Beautiful Campus" in 2006 and 2007. Pepperdine appeared on other lists including "Students Pray on a Regular Basis" and "High Quality of Life". Princeton Review also ranked Pepperdine University 13th in its list "Alternative Lifestyles not an Alternative". In 2007 Pepperdine was named as "One of the Top Producing Colleges and Universities" by the Peace Corps of America. U.S. News & World Report ranked Pepperdine the 34th best national university for undergraduate teaching in 2018. Pepperdine was ranked number 1 in the Institute of International Education's 2015 Open Doors Report, with 86.5 percent of all undergraduate students studying abroad during the 2013-2014 academic year. The School of Law placed 51st among the nation's "Top 100" law schools by the 2020 U.S. News & World Report rankings. It is known for its entertainment law, and also its dispute resolution program, which is currently ranked No. 1 in the nation. In 2018, U.S. News & World Report ranked Pepperdine's business school 65th out of 437 business programs in the United States. Forbes magazine has ranked the Graziadio School's Fully Employed MBA programs in the world's Top 20 based on ROI. In 2008, the magazine In Tune for music educators named Pepperdine one of the 38 best music schools in the United States. In 2009, the Sustainable Endowments Institute awarded Pepperdine a "C" for its sustainability efforts in the annual College Sustainability Report Card. In 2012, the American Council of Trustees and Alumni included Pepperdine in its What Will They Learn? study, which is an annual evaluation system of colleges and universities. The report assigns a letter grade to 1,070 universities based on how many of the following seven core subjects are required: composition, literature, foreign language, American history, economics, mathematics and science. Pepperdine was one of 21 schools to receive an "A" grade, which is assigned to schools that include at least six of the seven designated subjects in their core curriculum. Pepperdine University participates in the West Coast Conference, a conference made up exclusively of religiously affiliated schools. Appropriate for its location adjacent to the Pacific Ocean, Pepperdine's teams are known as the Waves. Pepperdine University was recently ranked by the Sears Cup as having the most successful athletic program for non-football Division I schools. (Stanford was ranked the most successful Division I athletic program with football.) Pepperdine University sponsors fourteen NCAA Division I intercollegiate athletics teams: baseball, basketball, cross country, golf, tennis, volleyball and water polo teams for men; and basketball, cross country, golf, soccer, swimming, tennis and volleyball for women. There are also several intercollegiate sports clubs such as men's soccer, men's and women's lacrosse, surf team, Ultimate Frisbee and men's rugby. In June 2012, Pepperdine administration denied a request by its LGBT students to establish a support group on campus called “ReachOUT”. The dean of the university said that the support group would conflict "with the school’s religious teachings on sexual morality". In December 2014, two female Pepperdine basketball players sued Pepperdine University for discrimination, claiming to have been harassed by their coach and other members of the Pepperdine community because of their sexual orientation. According to the 24-page complaint, "the coach believed that the plaintiffs were lesbians who were in a relationship and would cause the team to lose games". The jury in the case ruled against the players, claiming that they failed to provide evidence of discrimination. There are currently over 100,000 living alumni worldwide. Notable alumni of Pepperdine University include prominent scientists, musicians, businessmen and women, engineers, architects, athletes, actors, politicians, and those who have gained both national and international success. The Pepperdine alumni network consists of over 30 alumni groups on four continents. Battle of the Network Stars (1976–1988; 2017–) and Zoey 101 (2005–2008) were filmed on the campus. ^ As of June 30, 2018. "The Divine Connection". 2018. ^ a b c d e f g "Pepperdine University Common Data Set". Pepperdine University. Retrieved December 27, 2018. ^ "Official Colors | Resources | Pepperdine Community". Community.pepperdine.edu. Retrieved April 5, 2016. ^ "Malibu Campus – Seaver College" (PDF). Pepperdine University. Retrieved October 27, 2011. ^ Collier, Aldore (December 1989). "FaithDome: A grand-slam homer for Jesus. - Ebony". ^ Jahn, Vanessa (Spring 2006). "GSEP 35th Anniversary: A Celebratory Evening to Remember". Colleague Alumni Magazine. Archived from the original on May 4, 2008. ^ a b c d e f g h Domingo, Tracy (November 14, 2002). "Miracle at Malibu Materialized". Graphic.pepperdine.edu. Archived from the original on January 9, 2013. ^ Dochuk, Darren. "From Bible Belt to Sunbelt: plain-folk religion, grassroots politics, and the rise of evangelical conservatism". pp. 51–52. ^ "Pepperdine University | Los Angeles Conservancy". Laconservancy.org. Retrieved March 8, 2014. ^ "15 of the Most Beautiful College Campuses". Expedia.com. Retrieved January 8, 2018. ^ "Alumni Park". pepperdine.edu. Retrieved June 24, 2018. ^ "Meet the Deans and Directors". Pepperdine University. Retrieved April 20, 2015. ^ "Religion Division | Seaver College | Pepperdine University". Seaver.pepperdine.edu. Archived from the original on March 3, 2014. Retrieved March 8, 2014. ^ a b c d e f g "U.S. News Best Colleges Rankings - Pepperdine University". U.S. News & World Report. Retrieved February 14, 2016. ^ a b "US News Rankings". Grad-schools.usnews.rankingsandreviews.com. Archived from the original on September 14, 2010. Retrieved April 23, 2016. ^ "News | School of Law | Pepperdine University". Law.pepperdine.edu. December 6, 2013. Archived from the original on August 3, 2008. Retrieved March 8, 2014. ^ Anesha Smith. "member chart". Orderofthecoif.org. Archived from the original on March 27, 2014. Retrieved March 8, 2014. ^ a b "Best Entertainment Law Schools and Sports Law Schools". Top-law-schools.com. Retrieved March 8, 2014. ^ "Best Dispute Resolution Programs | Top Law Schools | US News Best Graduate Schools". Grad-schools.usnews.rankingsandreviews.com. Archived from the original on January 1, 2011. Retrieved December 27, 2011. ^ Giacobbe, Katie. "Pete Peterson Named Dean of Pepperdine School of Public Policy". Malibu Times. The Malibu Times. Retrieved April 24, 2016. ^ a b c "Seaver College Admission Fast Facts". Pepperdine University. Retrieved December 27, 2018. ^ "Yellow Ribbon Program - Education and Training". www.benefits.va.gov. 2016. Retrieved June 14, 2016. ^ "Yellow Ribbon Program at Pepperdine | Office of the University Registrar | Pepperdine University". www.pepperdine.edu. 2016. Retrieved June 14, 2016. ^ "Best Colleges 2019: Undergraduate Teaching". U.S. News & World Report. Retrieved December 30, 2018. ^ "Pepperdine Ranks No. 1 in the Institute of International Education's 2015 Open Doors Report | Pepperdine Newsroom". newsroom.pepperdine.edu. Archived from the original on November 28, 2015. Retrieved November 1, 2016. ^ "Pepperdine University – Green Report Card 2009". Greenreportcard.org. June 30, 2007. Retrieved December 27, 2011. ^ Czupor, Z.J. "National study ranks Colorado Christian in top 2% of colleges". Denver Post. Archived from the original on February 15, 2013. Retrieved January 11, 2013. ^ "Pepperdine University". What Will They Learn?. American Council of Trustees and Alumni. Retrieved January 11, 2013. ^ Windmeyer, Shane. "A Case of Denial: Pepperdine and Notre Dame Say 'No' to LGBT Students". The Huffington Post. Retrieved August 19, 2016. ^ "Pepperdine denies recognition of gay support group". The Mercury News. Retrieved August 19, 2016. ^ Wilson, Simone. "Pepperdine Admin Halts Creation of LGBT Club on Campus, Says It's Against 'God's Will'". LA Weekly. Retrieved August 19, 2016. ^ Fenno, Nathan. "Former basketball players sue Pepperdine, coach for discrimination". The LA Times. Retrieved August 19, 2016. ^ "Welcome | Alumni Association | Pepperdine University". Pepperdine.edu. Retrieved January 19, 2019. ^ "Under Construction | Chapters | Alumni Association | Pepperdine University". Pepperdine.edu. Retrieved March 8, 2014. ^ "Battle of the Network Stars". Retroland. Retrieved April 5, 2016. ^ "The Graphic - What Pepperdine learned in 'Zoey 101'". Graphic.pepperdine.edu. August 30, 2004. Retrieved February 24, 2016. Wikimedia Commons has media related to Pepperdine University.